Spring Toes using one of the Essie Spring 2016 colors! Spring is here and summer is just around the corner. We rush to the nearest gym to get swim suit ready, but what about sandal ready? Our feet hide all winter long in the warmth of wool socks and boots. The sun comes out and so do those toes! So break out the polish girls...we're getting sandal ready! Okay, first's things first, how's your skin doing? Little rough around the edges? Maybe dull and in need of some rejuvenation? It's time for a pedicure! 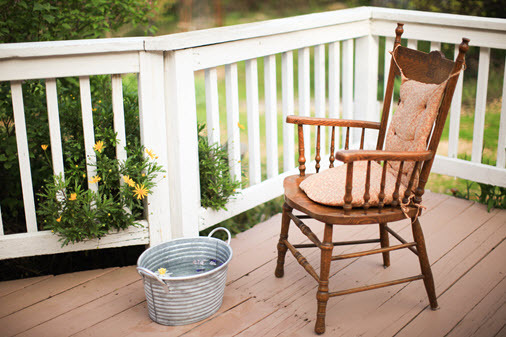 Play your favorite music, gather up some comfy pillows and find a calming place to relax. Fill a bucket or tub with warm (not hot) water and add a few drops of lavender or your favorite essential oil to get that aromatherapy working. Placing some flowers into the water will add to your experience. Relax and soak your feet for about fifteen minutes. Next, grab your favorite foot scrub to remove dull and rough skin. Message into your feet, concentrating on the roughest spots to break down dead skin cells. Then rinse off the scrub well. Trim and shape your nails. 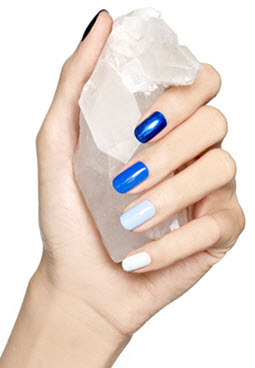 It's important to shape the nails to get a spa-worthy finished look. Get out a fresh emery board, choose either round or square and stick with that shape for every nail. For at home petties, I recommend pushing your cuticles back with a cuticle stick as opposed to cutting them. Trimming them can just cause me problems in the future. Now that all your toes are all in a row here’s my favorite part! Moisturize with a deep hydrating lotion. Massage into your feet and up your calves. Feel free to take your time with this. It's not very often we have the time to feel this great! 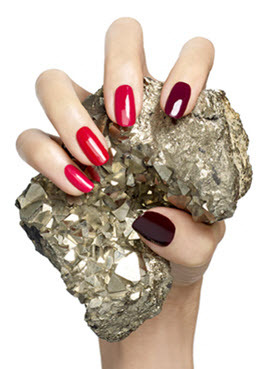 Finish with a beautiful polish of your choice. 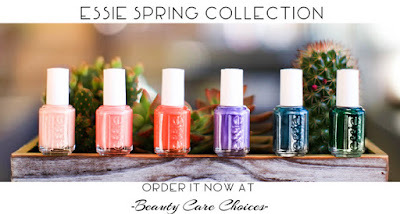 I'm choosing the beautiful "Off Tropic" green color from Essie's Spring Collection for my nails because I love anything green!) I'm in love with all the colors from Essie though, so it can be hard to pick a color! You can get the whole Spring Collection at Beauty Care Choices and it includes the top/base coat & a free mani-pedi disposable kit! Beauty Care Choices has added two skin care brands and, as usual, we want to share them with you. 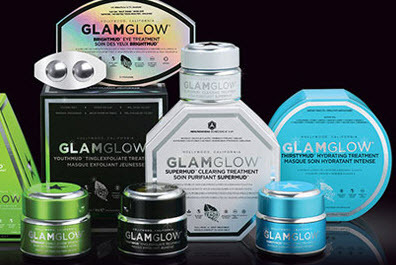 Finding new products that meet your beauty care needs, that work well and that you love is always fun and exciting. So take a look at these! Flora-py is skin care masks with amazing botanicals in formulas that meet every need. Each mask is individually packaged. The masks are made from 100% coconut fiber so they maximize the moisture penetration. Masks include Stress Relief, Anti-aging, Sweet Dreams, Clear Complexion, Even Skin Tone, Detox and Deep Hydration. So, pick one, put on some favorite soft music, close your eyes and relax for 15-20 minutes while a Flora-py mask performs its task! St. Tropez, the UK's top tanning brand is here for you. No need to cover those wintery white legs when your first springtime shorts day arrives! These tanning and self-tanning products are really the best! No streaks. Gone are the orange-y days of self-tanning. There are formulas for light to medium bronzing and for medium to dark. They come in lotions and foams and even an in-shower gradual tan lotion. Shop St. Tropez! To stay on-trend but not overdone, pick one item from a particular trend -- say, metallic eye shadow or glitzy lips -- and never wear more than one trend on your face at a time. OPI - a favorite of salons and DIY Nailistas - has just released their Spring/Summer "New Orleans" collection of colors. Are they not great! You can shop OPI's huge selection of colors, including the new ones at Beauty Care Choices! This video will give you a great technique for using lots of these great colors all at once...or any other group of your favorites! Totally fun! It's been centuries since British sailors discovered the key to avoiding scurvy: vitamin C. You probably grew up being told that getting enough vitamin C would ward off colds and other ailments, but now the word is out that vitamin C may not play a big part in staving off the sniffles. However, it does have a vital role in maintaining the health of your skin. Vitamin C, also known as ascorbic acid, is key to the production of collagen, a protein that aids in the growth of cells and blood vessels and gives skin its firmness and strength. Vitamin C also helps create scar tissue and ligaments, and it helps your skin repair itself. Vitamin C is an antioxidant that slows the rate of free-radical damage -- free radicals are unstable molecules that damage collagen and cause skin dryness, fine lines and wrinkles. New research shows that ascorbic acid 2-phosphate, a derivative of vitamin C, not only neutralizes free radicals, but also reverses DNA damage. While ingesting vitamin C is an important nutrient for overall health, little reaches the skin. As levels of vitamin C in the skin decline with age, replenishing levels directly in the skin can help combat collagen degradation and oxidative stress. Results from clinical trials show that when applied topically, vitamin C promotes collagen formation and mitigates the effects of free radicals, helping to maintain firm and youthful skin. 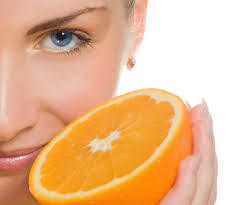 Look for Vitamin C (Ascorbic Acid) in your skin care products to help combat the signs of aging. Brands such as Cellex C, Clinical Care and Yonka all have creams, serums & lotions that contain C.
If you need full coverage of a blemish, birthmark or tattoo, watch this video to see why L'Oreal's Dermablend is the perfect product for you. Blonde Hair Care & tips for keeping it looking healthy & full of vitality! Whether you were born with blonde hair or you’ve decided to lighten up your look at the salon, blonde locks require a pretty specific maintenance routine. From keeping the color from turning brassy, making sure your ends don’t get dried out and protecting your hair from UV rays, there are some very important things to take into consideration when you’re a blonde or planning to go blonde. Even blonde highlights need extra care. Use a UV protective spray. Especially in the summer but also year round, make sure you’re guarding your hair against harmful UV rays that can change the color and dry out strands. Get purple shampoo. Strange as it may sound, purple shampoo keeps your hair color from turning brassy, which can happen with other shampoos that aren’t specifically formulated for blonde hair. Try Joico Endure Violet Sulfate Free Shampoo. Deep condition often. If you’ve bleached your hair to be a blonde, you’ve already stripped it of some color and moisture. To avoid looking like you’ve got straw for hair, use a deep conditioning treatment, and use it often. Malibu C Blondes Natural Wellness Treatment brightens blondes and removes & prevents hard water mineral build-up. It's great because it is both fragrance and sulfate free! Find a dry shampoo that works for you, and make sure it’s for blonde hair (not brunette). AG|Hair Dry Shampoo for Blondes is great! Refreshing your hair without shampooing will help keep the color vibrant for longer. Before going into a pool, use bottled water to get your hair wet. If your hair is already soaking wet when you go into a pool, it won’t soak up the chlorine in the water, which is what can turn blonde hair green. Use hair oil for fine hair (which is also great for light hair). Just from the mid-lengths to the ends, a serum for light hair will help to keep your strands moisturized. Schwarzkopf's BlondeMe Shine Enhancing Spray Conditioner is a great one. Make sure there’s not copper in your water supply, which can turn hair green. Combat this with an acidic hair rinse (like an aspirin dissolved in water). Instead of a towel, use a t-shirt to dry your hair after the shower. Friction with a towel can cause frizz and unnecessary dryness, but the soft cotton of a t-shirt will keep natural moisture in your hair. 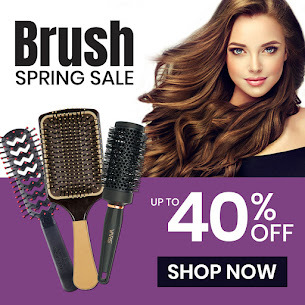 Beauty Care Choices sells top professional hair care products specifically formulated for blonde hair. 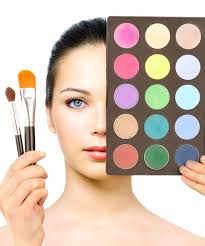 If you need help choosing a product, our licensed cosmetologist customer service staff will help. Just give them a call: (866) 409-7227. Can you go natural and get a great looking glow? 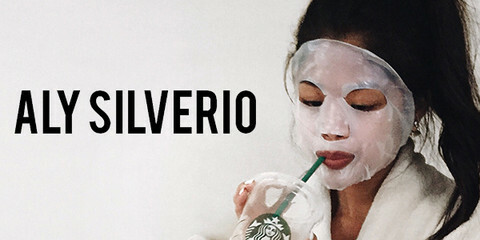 You can if you follow these five simple tips for creating the gentlest beauty regimen ever. Unlike your pots and pans, your skin needn’t be scrubbed or squeaky to be clean. So don’t overdo it. Mild, non-detergent cleansers—milks, gels, foams, or cloths—are your best bet. Scan the ingredient labels of products to see if they contain gentle, plant-derived surfactants (the prefix coco- equals coconut, for example; gluco- equals fruit sugars). Unless you have especially oily skin, there is no need for a toner. These were originally invented to restore the natural pH of skin after it had been washed with an alkaline-detergent soap. If you’re using a good pH-balanced cleanser, there’s no need for toner. It’ll only dry your skin. Make sure acid-laced products are pH-balanced. This means their pH is in sync with skin, so they gently remove sebum (an oily substance secreted by the skin) and makeup without stripping natural oils. Look for the words “pH-balanced” on cleansers that contain glycolic or lactic acids and on exfoliators because some have a low pH, which can cause dryness. If your skin is especially sensitive, opt for fragrance free. 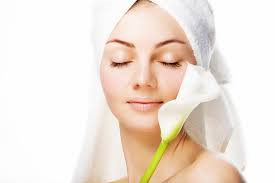 Fragrance is the most common cause of skin-care-related allergic reactions. The ones that are marked “unscented” typically contain small amounts of fragrance to help mask the odors of active ingredients. Choose multi-tasking moisturizers. A good day cream juggles two jobs—hydration and protection. Pick one that has plant-based moisturizers (natural oils, butters, and essential fatty acids penetrate skin better than man-made emollients like petroleum) and antioxidants (those from natural sources may also contain bioflavonoids and other beneficial compounds not found in synthetic versions) plus nonirritating physical sunblocks, like zinc oxide and titanium dioxide. Jane Iredale's new spring color collection of make-up is here and ready for you. The video below will show you how to apply for a "Gilded Goddess" gorgeous look! Spring and Sandals are just around the corner! Get your feet ready! Don't cut or manipulate cuticles. Whether you have your nails professionally groomed or do them yourself, the No. 1 recommendation is leave your cuticles alone. The cuticle is the natural barrier to fungus and bacteria -- and once you breach that, protection is lost. This will not only make cuticles look worse -- red, swollen, and ragged -- but may also land you a nasty infection that harms the nail bed and leads to permanent nail damage. And while cutting cuticles holds the most potential for harm, pushing them back too hard can cause problems as well. Moisturize the nail bed and the cuticle. While there is little in the way of medical data showing that moisturizing the nail bed will help nails grow, it can make cuticles look better and help protect nails from breaking due to a lack of moisture. If your nails are prone to breakage, it could mean they need moisture -- and putting oil around the cuticle helps moisturize the entire nail, which will reduce the incidence of chipping, cracking, and splitting. Recommended: Nailtiques Cuticle Care Oil, OPI AvoPlex Nail & Cuticle Oil or SpaRitual Cuti-Cocktail. Avoid acetone-based polish removers. The one product that all dermatologists agree you should avoid if you have brittle nails is acetone nail polish remover. It has been documented time and again that it strips the nails, causing them to become brittle. Avoid rough emery boards. Those old-fashioned orange emery boards are too harsh for nails, causing small fissures and cracks that lead to breakage and tears. Instead, file nails with a smooth, fine file and don't saw back and forth. File in one direction only and do it slowly and evenly to reduce risk of breakage. Recommended for thin, weak and natural nails: Flowery Fresh Picked Files. Change shampoos. While most women know when a shampoo doesn't agree with their hair, many don't realize it may not agree with their nails -- even if their hair looks great. This, say experts, is particularly true of detergent shampoos, or those for oily hair, which are designed to strip lipids and other natural oils from the scalp. If your nails are very dry and you are using any soap product that strips the oils, there is the potential to dry the nails. The use of a liquid acrylic nail compound known as MMA (methyl methacrylate) has been banned in many states and has been the subject of an FDA hazard warning, due mostly to high allergic sensitivity and serious nail damage. However, because it is an inexpensive ingredient, some manufacturers are still using it, sometimes in the form of black market products. How can you tell for sure? According to the American Academy of Dermatology, if your nail products have a strong, noxious odor; if nail enhancements are difficult to file; or they don't soak off easily, they could contain MMA. BeautyCareChoices.com has over 600 nail polish colors by Nailtiques, Venique, Zoya, Essie, OPI, Morgan Taylor and SpaRitual. Keratin is one of a family of fibrous structural proteins. Keratin is the protein that protects epithelial cells from damage or stress that has potential to kill the cell. It is the key structural component of hair and nails, as well as skin. Using a shampoo, conditioner or treatment that contains keratin with help strengthen and smooth hair. It also helps to soften coarse hair. 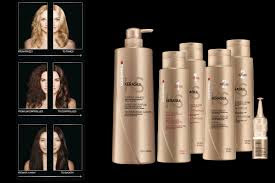 Goldwell Kerasilk products are rich in keratin proteins and silk protein. That's why we love it,; especially when a client has coarse or frizzy hair or when it is especially damaged. We recommend it for anyone with chemically relaxed hair. If you are looking for the right product to help your hair maintain a soft, silky texture, with a strengthening resilience, this might be just right for you. Right now, BeautyCareChoices.com has all Kerasilk products on sale at 20% off! Want the perfect "Easter Basket" goodie! After a bunch of jelly beans and some chocolate, your favorite kid is going to need to brush. 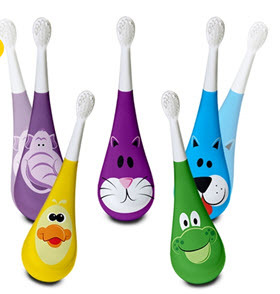 The "rockee" toothbrush will make it fun and is just perfect for kids...no matter how they set it down, it will wobble to an upright position! We love it and our customers give it 5 stars! Rockee's come in both solid colors and characters. Rockee uses one AAA battery which is included. Batteries last approximately 3 months with normal use. It also comes with 2 extra brush heads so you have a toothbrush that lasts! Our customer service staff get asked frequently about flat iron use and heat protection. One of our favorites is Thermafuse F450 One Pass. The reason: your straight, silky ironed straight hair lasts! A single pass also makes styling faster and smoother. Take a look! Nexxus Professional Hair Care is being discontinued! We have lots of customers who are loyal Nexxus VitaTress and Nexxus Phyto Organics users. Both of these product lines are being discontinued by Nexxus. So if you are one of our Nexxus fans, we stocked up on all we could get of both of these great brand lines and have put them on sale so you can stock up too. 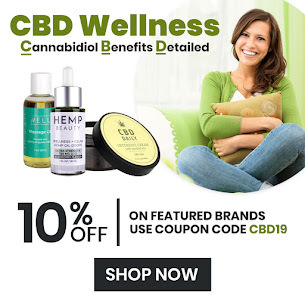 You can save 20% on all Nexxus Products right now if your order is over $100, plus you can save an additional 20% more on all Phyto Organics because they are already 20% off on the site.